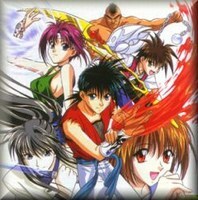 Plot Summary: Recca is a ninja. At least in his own mind. When he one day meets and saves the young girl Yanagi he pledges to be her ninja, defending her with his life. She shows him that she has the power of healing and in return he shows her his secret power of creating fire with his hands. But soon evil powers start reaching for them. Some wanting Recca’s ability to use fire and others wanting eternal life through experiments with Yanagi’s body, something that Recca and his friends definitely can’t allow.